I was at the bank yesterday pushing in a wheel barrel of cash to make a deposit when I happened to notice this sign on the wall. What I don't get is the "Sell" and "Buy" quotations. 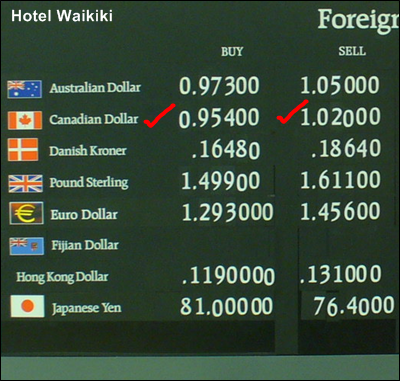 If you "sell," isn't the exchange rate suppose to be lower than the "buy rate?" I mean you buy at the going rate of the foreign currency and sell at a lost so the bank can make a profit for providing the service. In this situation I interpret "buy" as you buying foreign money from the bank, not the bank "buying" back money from you. When you try to trade one of your many, many US dollars for a Canadian one, they're only gonna give you 95.4¢ Canadian. You need to mow some more lawns and scrape together $1.046 to get one whole Canadian Loonie. When the Habs lose and the strippers on St. Catherine Street turn out to be not as attractive as you and your buddies had hoped, eh? - you'll want to sell back your Canadian dollar. Yes, it's worth $1.046, but they'll only give you $1.02 for it, leaving the bank with a nice, tidy profit of 2.6¢ for the transaction. Should'a just stayed home and gone to the movies with your friends. owner- I still don't understand it. Never mind. 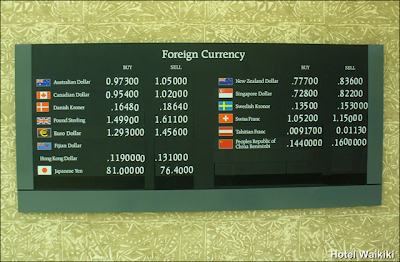 I do know that the canadian dollar use to be $.60 USD. Now it's 95.4¢ prolly due to the oil sands. The canadian dollar could not be worth more than the american dollar, could it?? Used to be you coud trade in a US dollar and get a buck-thirty Canadian. Sadly, the CAD is worth more. This happened once before, a few years back. They've always been very happy to accept your US currency "at par" (pay for a $15CAD item with a US $20 and get a Canadian $5 back!) but a few years back, I handed a parking lot attendant a US $20 to pay for $20CAD parking and he says, "You know I lose money on this, eh?" Knowing the US dollar would soon enough bounce back, he took my 20 jus the same. But I guess he just couldn't pass up the opportunity to finally say that back to a US customer. "Sadly, the CAD is worth more." Cloudia- you finally spotted land? Columbus Day, then. Arrrrghhhhhhh!!! When I went to Japan in 1970, the yen was 360 to a US dollar...and now it's 76 yen?!??? Sighhhhhhhh.... Why do you think the Japanese and Chinese love coming to Hawaii?